A befuddled young house finch chick wobbles on a wire testing his fledgling wings. He is a survivor! I am in endless awe of birds and their ability to survive the harshest of environments and their fierce tenacity! Their song and habits delight and surprise me! 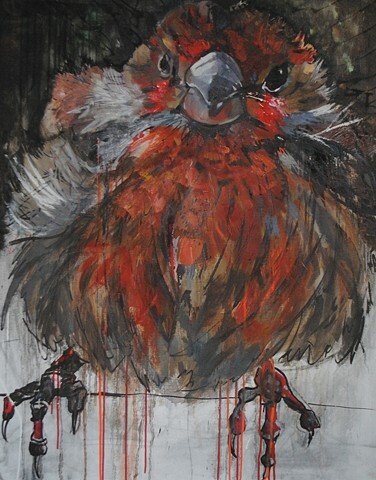 This finch is was a gestural drawing in Molotov marker refills and finished in aggressive and expressive oil painting that is my way of trying to get into a little of their world and express it in paint!